This chic little nightstand has a timeless and polished look, ideal for adding a striking decorative accent to your transitional decor. 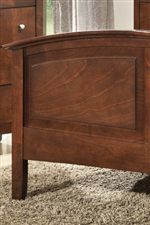 Combining both traditional and modern features, this transitional nightstand is adorned with tall, tapered block legs, beveled edges, crown moulding, and bright metal knob hardware. 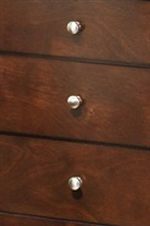 The broad top of the case is excellent for holding your cell phone and a lamp or reading light, and the three drawers offer plenty of space for all the things you need close at hand first thing in the morning. 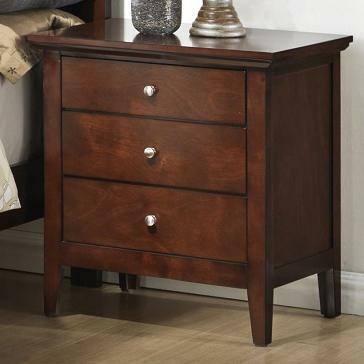 The C3136A Bedroom Transitional Three Drawer Nightstand with Tall Block Legs by Lifestyle at Sam Levitz Furniture in the Tucson, Oro Valley, Marana, Vail, and Green Valley, AZ area. Product availability may vary. Contact us for the most current availability on this product.